We will add an option in the Privacy panel of System Settings. This on/off switch enables to remove all internet connexion in any lens you have installed supporting the option (which are all lenses in the ubuntu repository). All lenses components and libunity are impacted by the change, as well as gnome-control-center. A couple of new strings will be added to the latest for the option. 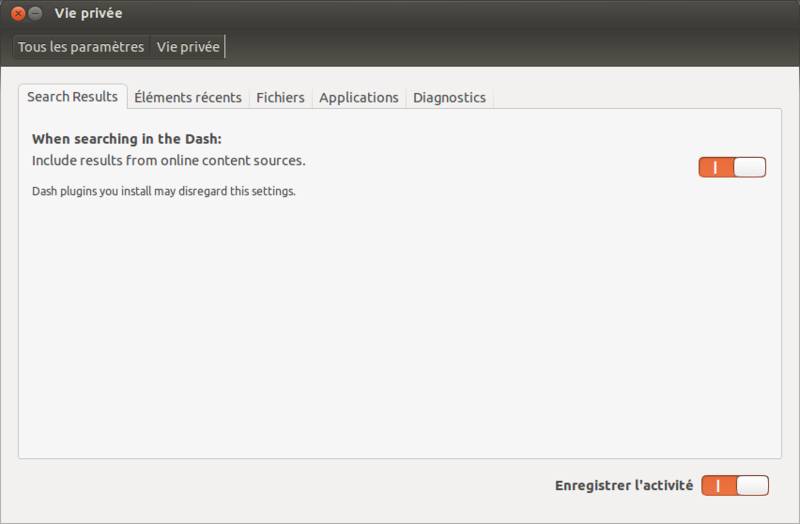 see on comment #27 the screenshot of the privacy settings dash panel. This one is in gnome-control-center (but the source is activity-log-manager for it). msgid "When searching in the Dash:"
msgid "Include online search results." The fact that this lens is installed by default means that users are shown commercial content as search results by default in the home screen, and that search queries are sent to an external (to the user) server. It's reasonable that one might want to turn this behaviour off. While it is possible to uninstall the package, this isn't a particularly intuitive route for most. Other lenses have a 'Filter results' item, which would solve this if on the home screen. Otherwise, an option somewhere in the control centre (privacy?) would be good. For that matter, I don't think this should be in the home lens by default. Every time I search for an application or a file, it seems that my search will be transmitted to the web. That should be opt-in, not opt-out. Please, put these results in a separate lens, not in the home lens. They would still be easily accessible when users want them, but there would be no privacy issue. It also avoids the negative publicity now growing on tech news sites like Slashdot and Hacker News. Thomas, could you file a separate bug about that please? I'd really like to keep this one about the one issue (and on topic). I'm happy to do that if you prefer, but I see it as two alternative solutions to the same bug. As you described, the problem is that commercial items show up during local searches, and transmitting local searches to a remote server breaks an expectation of privacy. You propose making the opt-out more visible, while I propose making the feature opt-in. If you still feel my comment should be a separate bug, let me know, and I'll open one. Yes. I'm asking for a way to disable the lens. You want it to present its results elsewhere. To me, these are related but separate. Thomas, yes please open a separate bug. OK, I've opened bug #1054776.
describing this feature will be updated. translated that would be ideal. The translators will be able to comment more. don't think I'd consider looking in the latter for this kind of setting. translators can update to Triaged if/when they approve this. Removed the app lens, it's been descoped by the design team and they still want those results to be shown here. +1 from the translations team, as I think such an important feature shouldn't block on translations. Please do send an e-mail to the ubuntu-doc and ubuntu-translators mailing lists as per the UIFe procedure, though. In any case, if as Iain suggests, the messages shown to the user could be generic enough so that existing translations could be used, that'd be a plus for translators. -1 from the Docs Team. Adding a switch to System Settings means that our docs are out of date. These are the docs that I spent most of my weekend working on, since the Design Team really needed to get those dozens of UI Freeze Exceptions done beyond the last possible minute on Thursday, and even Monday (for the new launcher icons). Every one agreed that docs would freeze yesterday at 9 pm UTC. That still gave all day Saturday, Sunday, Monday, and Tuesday for Canonical to scramble to find a fix for this problem. This is why we shouldn't approve very late major Feature Freeze Exceptions/User Interface Freeze Exceptions. These features *will* need tweaking. At some point, we actually do hit a hard User Interface Freeze/Feature Freeze. Considering that those "deadlines" passed a month ago, I believe we've already reached that point. Also, I don't think we can approve this until it is explicit about what exactly the UI will look like. If that's not agreed upon in advance, then there is a decent chance that people will want to change it again. From the docs side, you could just add an extra gsettings string. We don't document dconf-editor and while we do have some "gsettings set" instructions on other pages, you could say that arguably using Software Center to remove the lens is better since it's graphical and easier. Or you could remove the shopping feature. It's very easy to remove documentation. Scott, we've been discussing this in #ubuntu-desktop. It's not as easy to disable all online results, and someone who wants to use the social networking integration (Gwibber lens, photo lens, even Google docs scope for files lens) but not the "ads" doesn't have a way to do that easily in the GUI. Hi Jeremy! So, I understand that I shouldn't modify the Google Docs scope to respect this setting? As the admin of the French localization team, you have my +1 too. As a translator, three extra strings are not a big deal, so +1 on that account. I also think this option will address important privacy concerns. However, I do feel there have been too many UIFE this cycle, as #11 indicates. It is a huge motivation killer to lose a couple of hours of work due to some external change you have little control over. Just imagine losing a couple of hours worth of work on some nice feature. Especially when you are a volunteer donating your free time to a project. Ok, changing the UI this late most affects documentation (me) and the translators. Since we now have 2 +1's from translators not counting dpm's +1, I'll change my -1 vote from the Docs Team to a +1. Please, please let's handle the feature & UI freezes better next cycle. I'll update the documentation tonight and make sure the ubuntu-docs pot gets uploaded. As another translator, I agree with Redmar, so +1. FFe approved for the "Hopefully real final design" as long as it can be uploaded very soon. Can these all be uploaded by Monday? If we're going to churn the design again, then please ask again. 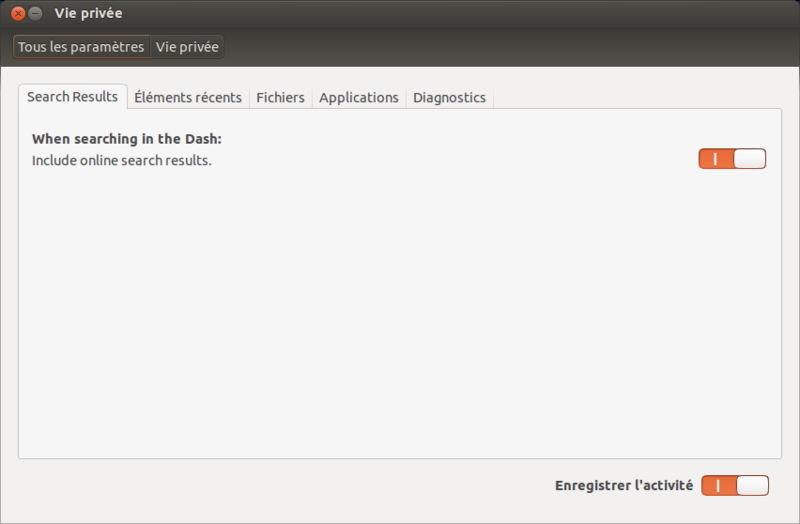 I've updated to activity-log-manager 0.9.4-0ubuntu4, but I can't see the new tab. I don't appear to have the "com.canonical.Unity.Lenses" schema installed, even though I'm running unity. @Michael: I only explicitely told it on IRC and G+, but the panel will appear only when next Unity release (with the lenses supporting the option) will be out. That's why there is this schema test. Does this proposed fix prevent *display* of results, or *sending* of queries to the productsearch servers? The latter is clearly what's desired by the community. Additionally, the proposed design in comment #27 is misleading. This setting doesn't guarantee that all online results will be omitted from the dash. The proposal in comment #18 is "correct" in describing the scope of this setting. * Make libunity9 depend on unity-common >= 6.0.0-0ubuntu3 (LP: #1055019). #32 is right: "Include online search results" sounds like the search is performed and the results are just not displayed. Please change it to something like "Search online"
@lpah012: The UI text cannot change anymore at this point, it has hardly been translated now, and we're very close to the release date. The switch prevents Unity lenses to perform online searches, isn't that clear enough? It looks like there's no further release team action for this bug, so unsubscribing the team.